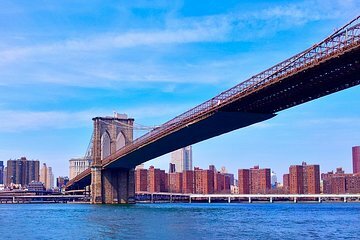 Entdecken Sie den industriellen Charme des DUMBO-Viertels von Brooklyn am Wasser und der East River - Brooklyn Bridge - auf einer privaten geführten Tour. Erfahren Sie auf dem Weg von Manhattan nach Brooklyn die Geschichte der Brücke und hören Sie die Geschichten hinter ihrem 14-jährigen Bau mit zahlreichen Möglichkeiten für Fotos. In Brooklyn angekommen, besichtigen Sie DUMBO, eine aufstrebende Gegend mit Indie-Geschäften und lokalen Restaurants am Fuß der Brücke. Sie enden im Brooklyn Bridge Park, wo Sie eine Handvoll Restaurants mit Außenterrassen (bei gutem Wetter) und gelegentlichem Imbisswagen oder -wagen finden. We enjoyed the opportunity to not just walk across the Brooklyn Bridge, but to do so with a guide (Gary) who was well informed and able to expand and explain so much of the history and the area around the bridge. He was also able to provide insights as to where to take pictures (and eat in the DUMBO area. Highly recommended!!! This is an iconic part of New York with tons of history behinds the scenes. Our guide, Gary was fantastic! Very knowledgeable, fun, great sense of humor, and kept our two teenage boys engaged for several hours. We couldn't have asked for more. Besides the tour, Gary helped us with our transportation arrangements, actually took us to a restaurant and had us seated inside at the end of our tour! Way above and beyond our expectations and loads of fun. Highly recommended! Gary was great, he told us lots of information at the correct pace. The bridge is a great was to see the city from a different perspective. We went to a fab pizza place Juliana's, at the end of the tour which Gary recommended . Our tour was more than described because of our excellent guide, Gary. Though crowded because of the holiday crowds, we had a flawless, enlightening, and humor filled tour. Our out of town guests were very pleased with our tour, and the time frame was perfect. We had a nice time. Gary was our tour guide and was friendly and knowledgeable. We felt comfortable with him as he guided us over the Brooklyn Bridge and parts of Brooklyn Heights.. We went on a Sunday and it was hot but not too crowded. I recommend this tour.